With so many opportunities and methods to borrow money or get a loan, it can be difficult to know which way to turn for the best deal. Recent years have shown a rapid rise in quick loans including logbook loans, payday loans and personal loans making that decision even harder. While all have their merits, you should be aware of the terms and conditions of each as well as the interest rates and repayment terms to make sure your chosen loan is most suitable for you. In this article, we'll look at two of the more prominent names in fast loans - Car Cash Point and Cash Converters - to make a comparison of the two. You probably recognise the name Cash Converters as being a high street retailer. Buying and selling household goods, in the UK they have over 200 stores up and down the country. But these days, that's not only what they're known for. In recent years, they've branched out into several different areas, including personal finance. As well as their Cash Advance Loans (similar to payday loans), Cash Converters now offer Personal Short Term Loans. So how do their rates stack up, and is it worth taking a loan out with them? Let's have a look. Limiting themselves to the smaller loans, Cash Converters allow you to borrow anywhere from £50 to £1,000 - perfect for emergency use. Their loan length is also relatively short, ranging from 3 to 12 months which might make your loan unmanageable if you're in need of a longer term. They will also need to run credit checks on you before they can approve the loan, so if you have bad credit history, you might be out of luck. Even if you do fulfil the credit criteria, their APR is an eye-watering 446.9%. 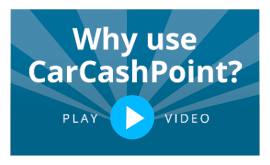 At Car Cash Point, we provide instant loans to car owners simply by using the vehicle as security and releasing the cash from your car. Provided your vehicle is free from finance (ensuring you own it outright), we don't have to carry out any formal credit checks on loan applications. So, even if you've had credit problems in the past, it shouldn't be a problem getting approved for your logbook loan. We also pride ourselves on never being beaten on price. We're the cheapest and best value logbook loan provider in the UK and if you find a lower rate than ours anywhere else, we'll guarantee to beat it by 10%. And, with a maximum of 230.70% APR, ours is almost half that of Cash Converters. Our repayment periods are also longer meaning they will better suit your own finances. Your logbook loan can be repaid over durations of between 1 - 5 years with no minimum period. You can also make capital overpayments to your loan and pay less interest, whether you use our weekly or monthly terms. And if you want to pay off your loan early, we have no early repayment penalties or fees - guaranteed. Reading through this article will hopefully have put your mind at ease over any finance worries you may have had and shown you the benefits of taking out a logbook loan from Car Cash Point. If you have any other questions, call our team today on 0333 220 4419. They'll be happy to guide you through the process step by step and get your cash to you as quickly as possible.